The acquisition of Adams Golf by TaylorMade adidas Golf hasn’t hamperedAdams’ product introductions. The latest is the SpeedlineTechdriver featuring the FASTfit adjustment system the company says can deliver up to 11-yards more distance with 54% better accuracy. 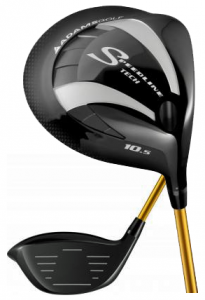 Additionally, since Adams was among the first to refine driver clubhead aerodynamics in the original Speedline they have applied the sixth generation of improved head shaping to the SpeedlineTech. FASTfit Adjustability is quick to use by unscrewing the hosel and rotating the head from open or closed by up to 1 degree which also results in an adjustment to the loft by +/- 1 degree. The clubhead can also be adjusted 2 degrees upright. Adams’ 3DS FaceTechnology, a tweaking of the club face bulge and roll, to compensate for the fact the majority of golfers hit the ball from the high toe through an area running down through the center to the low heel. The 54% increase in accuracy comes from the configuration producing the best spin and launch in all three hitting zones. The SpeedlineTechdriver will be available this week with the Ozik RÅªL 54 as its stock shaft for a suggested retail of $449.99 and a street price about $50 less.